The Cleveland Indians cleaned up some roster questions on Tuesday, optioning Lonnie Chisenhall and Matt LaPorta to Columbus. Neither move should come as any big surprise, although there is the requisite grumbling from some fans about the move to start the season with journeyman Jack Hannahan at third base over Chisenhall. 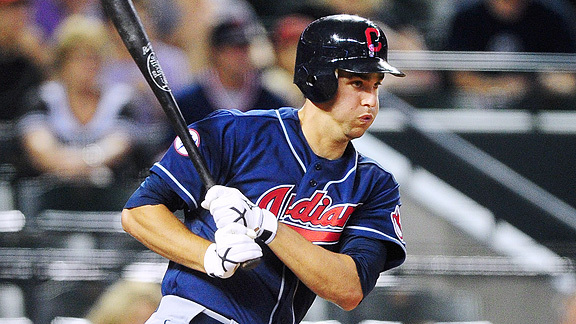 Chisenhall hit just .205 during spring training, however, with 16 strikeouts and only one walk in 16 games. Chisenhall needed to hit to win the third base job as Hannahan has a major edge when it comes to defense, something the Indians are going to need plenty of if the offense struggles to score runs as expected. Just as important, Chisenhall still had a minor league option left so it was no problem for the Indians to send him down. He’s only 23 and it is not as if he ripped up AAA pitching last year, batting just .267 with seven homeruns and 45 RBIs at Columbus. If Hannahan struggles at the plate, or gets hurt, Chisenhall will be on the first bus out of Columbus. This move in no way ends his time in Cleveland, it just delays things a bit. Unless something drastic happens, Chisenhall is the third baseman of the future. Delaying his coronation so he can get a little more experience isn’t going to hurt anyone or stall the Indians quest challenge the Tigers for the division title. The same can’t be said of LaPorta, who we’ve hopefully seen the last of on the big-league roster. LaPorta has been given every chance to show he is an everyday, major-league player and it seems pretty obvious that he is not. Even with Casey Kotchman taking over at first base this season, the Indians would have found a roster spot for LaPorta if he could hit. But after watching LaPorta hit .167 with one double, two RBI, 11 strikeouts and one walk during spring training, the Indians have obviously seen enough. Second verse, same as the first: One day after Browns general manager Tom Heckert said “we think he’s going to be much better this season” in regards to incumbent quarterback Colt McCoy, head coach Pat Shurmur did his part of talk up McCoy. “At this point, he’s our quarterback,” Shurmur told The Plain Dealer. “We’re looking forward to him being our guy and I’m looking forward to seeing him improve. We believe he has a chance to be a fine player in this league. Of course, that’s not stopping the team from planning to attend Ryan Tannehill’s Pro Day on Thursday at Texas A&M. The team also plans to bring Tannehill to Berea as one of their 30 pre-draft visits, according to the paper. That could be a sign the Browns are considering bringing Tannehill on board, despite what they are saying in public about McCoy, or it could be an attempt to drum up interest in Tannehill from another team. There’s at least one person who believes the Browns should go ahead and draft Tannehill at No. 4 – despite what the “experts” thing his draft slot be – if the Browns truly believe he’s the guy. “Franchise quarterback trumps all,” Mike Mayock of the NFL Network said, according to Pro Football Talk. “We talk about that all the time, and I don’t believe Colt McCoy is the answer. And I do believe Ryan Tannehill could become the answer. So I believe at No. 4 they ought to pull the trigger on Tannehill. Injury bug bites Gibson, again: Looks like it is season over for Cavaliers guard Boobie Gibson after the team announced on Tuesday that the sixth-year guard has a torn tendon in his ankle. The team said that Gibson is still being evaluated and has not decided on treatment for the injury. In his sixth year with the Cavs, Gibson has yet to play a full season. Win now only works if you actually win: Finally, we’re still trying to figure out why the Redskins are a team the Browns should be trying to copy.